Lascaux II v. Lascaux 4! What an interesting scenario this is! We’ve always been awe-struck by Lascaux II as have our visitors. Created over 40 years ago, it is just amazing how accurate it is without the use of modern computer surveying technology. Plus, the paintings were produced the same way our ancestors did – both in terms of materials and techniques. Fast forward to 2016 (just – Lascaux 4 opened on the 15th December last year, so it just scraped in after 30 months of construction and various delays due to supply problems, financial problems, weather problems – the usual thing for a major project and, of course, there were teething problems. The more technology involved, the higher the certainty of that occurring – and there is lots of technology at Lascaux 4. 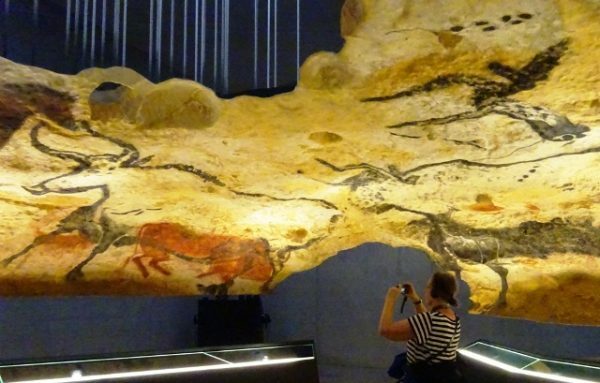 What is it like to visit Lascaux 4? 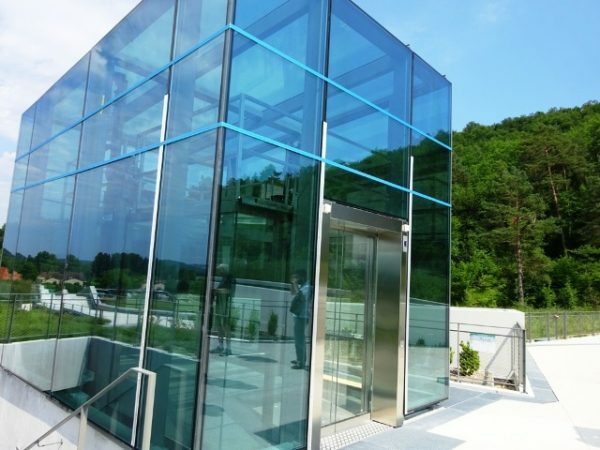 The experience starts with a ride up in a glass sided lift troof level where one of the Lascaux guides sets the scene with an introductory talk. You then make your way down into the facsimile cave area – initially pausing to allow your eyes to adjust to the reduced light levels. Then it’s into the ‘cave’ itself. You get really close up to the art in the Workshop – and you can take photos! For this year and we are told, next year, it is still possible to visit Lascaux II. So what is that like now? Amazing, is the answer! 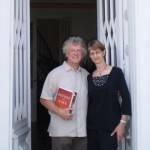 The future of this gem is uncertain – it is believed it is to become an educational resource – lucky students! Meanwhile, it is still open to the public during 2017 and 2018 – after that, who knows? 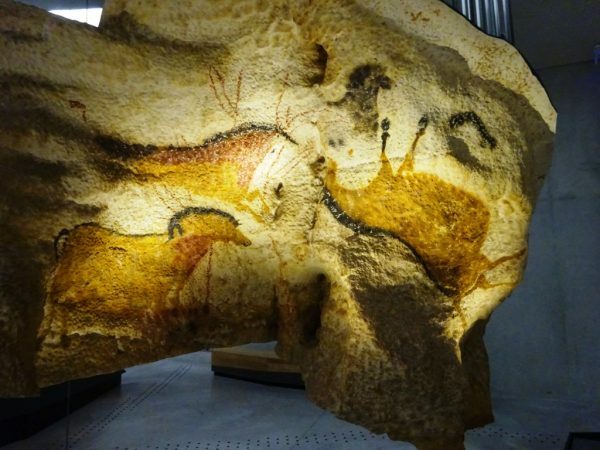 The two sites have really become rivals – Lascaux II has to earn its keep, so they had to come up with something to attract visitors. And they have produced the goods! A visit now is not only longer and groups smaller – so much better to absorb what is in front of your eyes – but the guide extinguishes the electric lights and lights a flame lamp which flickers. This is as close as we are ever going to get to appreciating and experiencing just how it was for our ancestors – and even that doesn’t really get close. We know the electric lights will go back on and there is a back up emergency plan if anything goes wrong – our ancestors didn’t. They might have been deep in the cave when their lamps went out – or something came out of the shadows (be assured this is not a modern day hazard!). 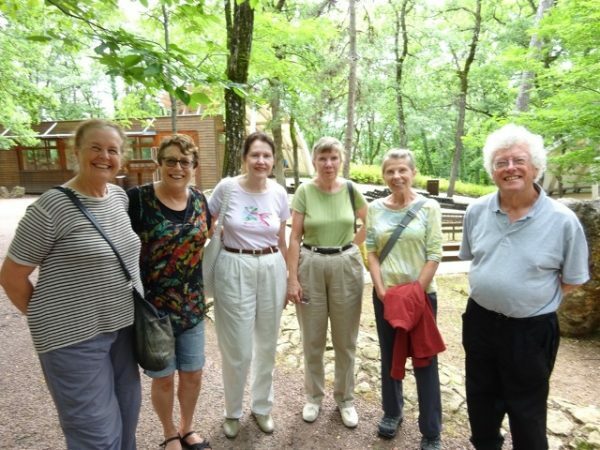 Visiting Lascaux II, we can get an idea of how it was – but try to imagine, how it really was……. you have to be there to experience it! So what have our guests this year thought? Without exception, everyone has said that it is well worth visiting both sites – each has their own strengths and weaknesses which partly depend on individual preferences, a major one being one’s attitude and feeling about technology biased visits. 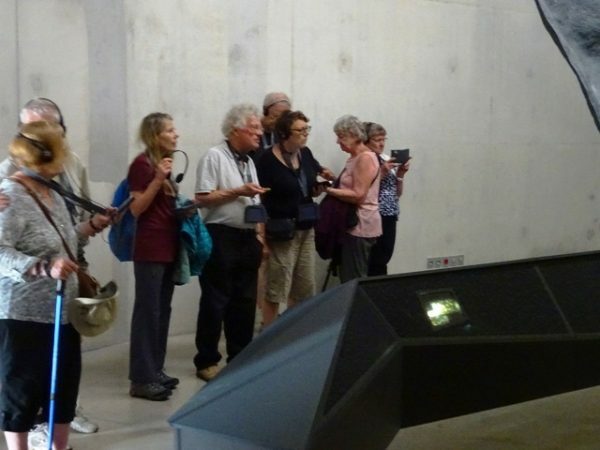 Visitors are ‘guided’ around the The Workshop area using the site’s digital tablets which everyone is issued with at the beginning of their tour. These are triggered by sensors on approach to an exhibit. It doesn’t work for everyone! But, this is where you really score if you join us on a Caves & Castles Tour – the exhibition area is the perfect place for Steve to fill you in on background information which it is not possible to include on the official tour and, of course, answer all those burning questions you are bound to have. Even some of the newer official guides ‘pick’ Steve’s brain by asking him questions! The Workshop at Lascaux 4 is a great place for Steve to explain more and answer your questions. In our opinion, it will be a sad day when Lascaux II is no long available – but this year and next you can get the best of both worlds, so come and join us and experience it for yourself, it may be your last chance! – and we’d love to know your views.